There are so many great places to eat in Toronto that it can give you option anxiety. it’s one of the biggest things I miss about Toronto – the culture and the numerous restaurants. Out here in Calgary you mostly find large chains and it’s nothing like what you get from the smaller independent restaurants that line the streets of Toronto. For what you get, Da Maria is very cheap. The portions are large and the meals are usually more than just one course, though you don’t really get that information anywhere on the menu. You definitely won’t leave hungry. Another thing to have here is the spaghetti with tomato sauce. They looked at me kind of funny when I asked for a plate of spaghetti once, but it’s because they serve it mostly as a side dish to their meals and it’s not meant to be anything special. Their sauce tastes like there’s a lot of TLC put into it but don’t get me wrong, it’s a very simple sauce. it’s that simplicity, however, that makes it to die for… You can tell that this restaurant has been, and is their life – you won’t be disappointed. Albert’s is a great place to get some Jamaican take-out – on the walls you’ll see photos of countless celebrities that have eaten there. They do have a few seats if you want to eat there but we’d always get it to go. Albert’s oxtail is great and Michelle says "you’ve never had Jamaican beef patties until you’ve had one at Albert’s." Yes, they are that good, and they are that much better than the ones you can buy in the subway. If you’re afraid to try the oxtail, don’t be – they have three different sizes so you can always order the smallest portion… The prices are very reasonable and edging on the cheap side ;-) Many Jamaicans swear by Albert’s and it has gained the reputation of being one of the best, if not the best place for Jamaican food in Toronto. There’s not much to say about this place other than the pho is good and you have to order the spring rolls. Every time we went with Michelle we sat on the patio and the service was always good. Great pho. This is not one of Toronto’s best kept secrets because the place is always very busy. There are long lineups to eat-in and long lineups for take-out. But it used to be one of Toronto’s best kept secrets back when I first got introduced to it. Since then, they have renovated big time and the place looks much more modern – you can also tell that they were expecting to accommodate large numbers of people in a relatively small space. it’s exceptionally clean, probably the best Thai food in Toronto and a lot of value for your money. In a word? Fresh. I really miss this place a lot. it’s by no means fancy and service is obviously not their forte, but the food is great, fresh and cheap. And did I mention that the food is great? This place gets very busy (actually, it’s busy all the time and it never seems to die down) so don’t expect to get a table all to yourself. Michelle and I remember going to this place once and getting seated at a round table for eight, with three other couples. It was memorable because each of the four couples sort of kept to themselves and all four couples were speaking in four different languages, none of which were English nor Cantonese… I love Toronto! Apart from the great, unparalleled food, one of the other things that separates this place from its many neighbours is that they always give you something for free. Be it their complimentary house soup before you start your meal, or a daily dessert that they’ve specially prepared, you always get something more. There are four words that I would use to summarize this place – exceptional food, exceptional service. If you walk by this place on an empty stomach, you’ll end up eating here for sure. Right in the front window sits their rotisserie rack with usually 30 or 40 chickens roasting at any given time. The smells that come from here are enough to convince you that you’re hungry, even if you just ate and you know you’re not! Though they do have a couple seats to eat-in, it’s mostly a take-out place. Very comfortable atmosphere and very friendly staff. Prices are relatively inexpensive and you’re sure to leave on a full stomach. I recommend the 1/4 rotisserie chicken (of course) with the "hot sauce". They ask you if want the hot sauce or not, and it’s actually not that hot so I recommend having it – it makes the chicken even more delectable. Oddly, the chicken is not at all greasy and it comes with these tiny Parisienne potatoes that are made in house (so good!) as well as rice with black olives and other great stuff in it. The combination of these three things is amazing. Great award winning take-out pizza by the slice. Huge slices, very affordable, fresh and a wide variety of choices. Not your typical fast food pizza at all. My favourite here is the spinach and feta pizza – I can’t remember what they call it though. Cora’s is open very very late. Just go! This place is not at all cheap, but with a reservation you don’t have to pay to go up the CN tower so that’s a bit of a bonus. I’ve eaten here enough times (more than five) to feel comfortable recommending it, plus Michelle and I got engaged here :-) The food is incomparable to anything and the presentation is equally great. The menu changes often but has always been good and diverse every time I’ve gone. I mention this place because it’s gorgeous of course, but also because it’s a drastic contrast to what you find at the Calgary Tower. The food at the Calgary Tower is so bad you’re better off eating at a greasy diner (seriously! ), but this is not the case at all with the CN Tower. it’s well worth the price (yes, it can get pricey, but not exaggeratedly so) and the experience will definitely be a memorable one. Great food x10. It would be a sin and a crime to not mention Dutch Dreams. For Michelle and I, it was a dream just to have this place a block away from our house. This is, unquestionably, the best ice cream in Toronto, period. My favourite ice cream is maple walnut but I have never had maple walnut ice cream like at Dutch Dreams. I can taste the creaminess in my mouth just by thinking of it and I miss it oh so much! I have yet to find anything that comes even half-close to this anywhere in Alberta. On top of your ice cream, (go for the made-in-house waffle cones, of course) they put little pieces of fresh fruit – kiwi, strawberries, whatever’s in season. it’s a very nice touch. I wouldn’t consider the prices to be cheap (we used to pay about $14 or so for two cones) but you’ll still walk away feeling like you got a great deal. (And yes, you can buy their ice cream in pails too!) Wherever you go for dinner, skip dessert and go to Dutch Dreams for ice cream! So, there you go, there’s my list of ten places to eat in Toronto. 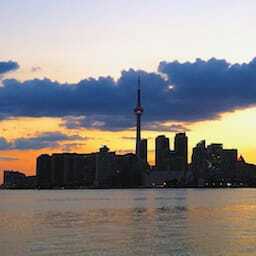 Let me know if you know of other exceptionally outstanding, memorable places to eat in Toronto. Ten Places to Eat in Toronto was published on Tuesday, March 11, 2008 at 3:30pm MDT by Daniel Menjívar and last updated on April 11, 2018 at 9:30pm UTC .